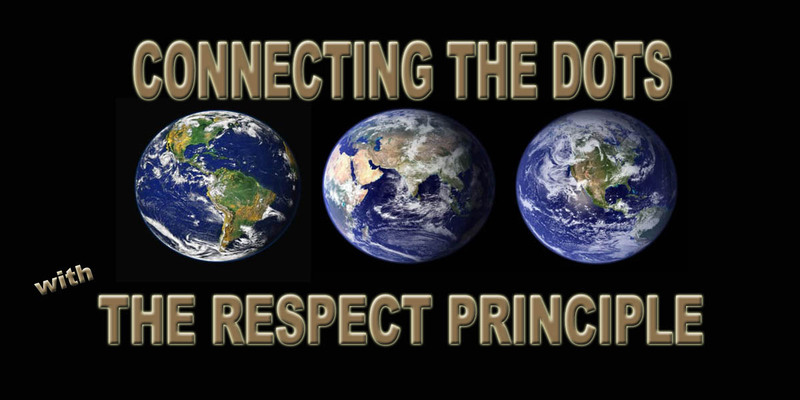 The challenge in choosing to respect … value every person results from the daunting task of seeing, disliking, and even hating bad behavior … yet not the person or humanity. I know I struggled with this challenge most of my life like many people do because we are taught by experiences to do so … that is, until our Respect Level rises enough to see other humans as equal to us … in all their failings … and ours too. There are those whose physiological makeup, their brain’s function, is impaired by natural chemical imbalances … natural mental health challenges, but a lot of mental health challenges are created by the world we live in and how we have shaped it by our choices of action or apathy … just going along for the ride. Seen from the bigger picture perspective, we all make mistakes. Many people develop negative or blaming mentalities because to admit their own contribution may seem like a blow to what is often an over inflated ego… the kind developed and used to compensate for the unhealed wounds that still hurt. I know because I lived that way too for most of my life … because I bought into the fallacy that my bad behavior, whether fueled by naivety, ignorance, disrespect, hurt, resentment, or anger, was who I was … someone bad … but I have learned we are all susceptible to bad behavior for a number of reasons, yet at the same time each and every one of us is a person … a human being … and what redeems us all is seeing beyond the bad behavior to help people in ways we can so they can develop the good behavior that results from feeling valued … respected regardless of the mistakes made … the bad behavior we manufacture. And for any Christians reading this, we are called to forgive as many times as it takes, to help others get on the right track of good behavior by not adding another wrong on top of a wrong. It’s called love. Kaitlin Ann Trepanier … The Respect Specialist, Humanitarian, Social Entrepreneur, Creative, and Writer. The company creates, publishes, and produces books, products, and services to free potential based on the concept and global initiative “Connecting the Dots … with The Respect Principle.” I look forward to discovering how I can help you and others unleash more potential for greater success, enhanced quality of life, more joy and peace! Ebooks available at www.smashwords.com and other Ebook retailers.